Staying in Zion National Park or nearby communities offers the visitor close proximity to the beauty of this incredible park, including the colorful canyon walls, soaring towers and fascinating shapes. 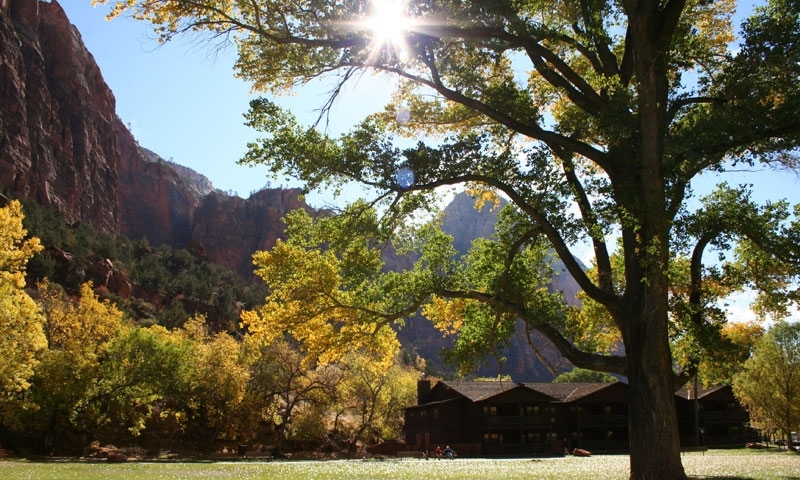 There is only one lodge that accommodates visitors to Zion National Park, offering a unique experience in park lodging. Reservations can be made by calling 888-297-2757. Zion Lodge is a hotel of rustic design, giving the guest marvelous quiet and a peaceful place to stay during your visit to the park. Once you enter the park from Highway 9, simply follow the signs to the lodge. Zion Lodge is open all year with special winter packages from December through the middle of March. Accommodations include 40 historic cabins, 75 comfortable motel rooms and six luxurious suites. Cabins boast gas log fireplaces and private porches and all are within walking distance to the lodge. Motel rooms have a private porch or balcony. Suites are perfect for a little luxury, with sitting room and wet bar. Fine dining is yours at the Red Rock Grill, with magnificent views. Casual dining is available at the Castle Dome Café. You can browse the gift shop to find mementos of your trip. Nearby attractions and activities include horseback riding, climbing and touring Emerald Pools, the Narrows and much more. Rangers give evening programs and talks at the Visitor Center and at the campground amphitheater. There are a wide variety of trails for fabulous hiking to get up close to all the sights. There are 3 campgrounds in Zion National Park. Reservations for Watchman Campground must be made from March to November by calling 877-444-6777, otherwise it is first-come, first-served. The other campgrounds are on a first-come, first-served basis when open. South Campground is located close to the south entrance, on the Virgin River. There are a few riverside sites. When coming to this campground, be aware there is little shade and summer temperatures can exceed 95 degrees. All 127 campsites have a picnic table and fire pit with grill. Pay showers and a laundry are in nearby Springdale. Comfort stations have flush toilets and cold water, which is drinkable. Watchman Campground is a quarter mile from the south entrance and has 162 sites (69 tent-only). There are few trees so there isn’t much shade. Remember this when planning your trip for temperatures can get quite high in this desert countryside. The Virgin River runs along the edge of the camp. Each site has picnic table, fire grate, and there is an RV dump station. Restrooms and drinking water are on-site. Lava Point Campground is located off the Kolob Terrace Road. It’s 25 miles north of the town of Virgin. The six primitive campsites sit at an elevation of 7,890 feet, with plenty of views from nearby Lava Point Overlook. There are pit toilets. There is no fee for camping here. Lodging options near Bryce Canyon National Park. Places to stay near Zion National Park.